We have just recovered from record heat in SoCal. We had here in Burbank and the San Fernando Valley 105-110º for a whole week. It was horrible. It didn't even cool off but to the 80's at night. It was like being in Lake Havasu(which I hated-sorry Havasu people). I know some people like the heat. But I do NOT nor does my garden. It's difficult to work outdoors at all. Then on Friday a fire started in the Verdugo Hills just about a mile away! We could see scary flames from our house for 3 days! The finally put it out(at least on our side) last night. We even had a little rain last evening and cooled down enough to open the windows. For those from other places who may not know, in SoCal, we go without rain from about May - Nov. So any rain we do get in the summer is rare and awesome! 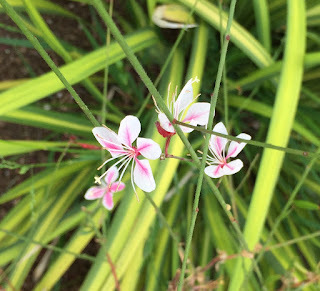 Gaura is a perennial in SoCal that is native from Louisiana, Oklahoma and Texas. The common white flowered variety is a noxious weed. 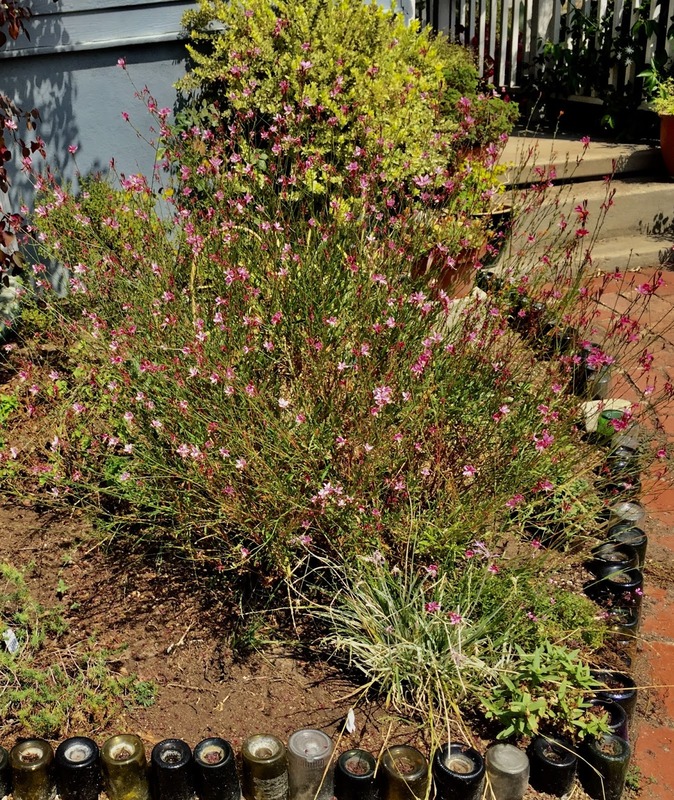 I will never forget mistakenly planting it for the first time for a client in Pasadena where it spread like crazy! I was forever digging it out. BUT, the pink variety, Gaura lindheimeri Siskiyou Pink is so much nicer! 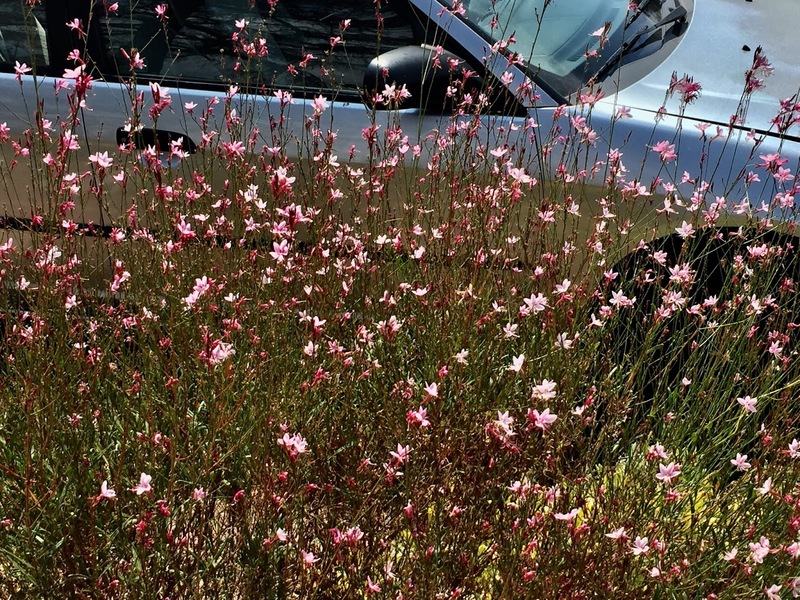 It doesn't spread but instead makes this airy mass of pink flowers. I have not had any reseeding in several years in my garden. It has skinny leaves that you can barely see. It is such a wispy plant that it was difficult to photograph in my garden today. The flowers look like little pink butterflies. Gaura grows best in well drained sandy soil(which I have!) and full sun. If it has one bad quality at all, it is that I have to cut it back about twice a year. When it stops flowering for a bit, it is good to give it a whack! Then it grows back prettier and flowery. It is said to bloom in the summer. But here is SoCal it blooms for quite a long season. Research says it grows in zones 5-8. See how it was difficult to capture in a photo! The flowers begin dark pink and sometimes fade to pale pink and white. Laura is said to grow to 4 feet tall. Mine are 4'tall and wide. 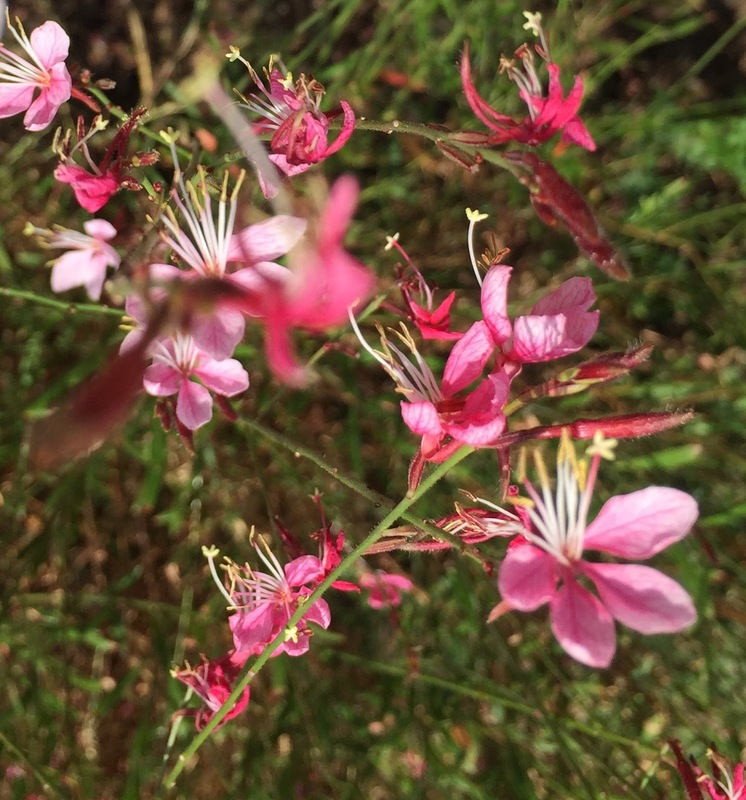 The name Gaura comes from the Greek gauros meaning superb in reference to the beautiful flowers. This species honors Ferdinand Jacob Lindheimer (1801-1879), Texas plant collector.